American and British media agencies are celebrating the nomination and ascension by Myanmar politician Aung San Suu Kyi of her driver and aid as “president,” as well as her pledge to “rule above” the president – effectively rendering the office as symbolic and subordinate to the unelected Suu Kyi. The West celebrates such developments when it would otherwise condemn them as un-democratic, and Suu Kyi as an un-elected dictator – primarily because while the president will be subordinate to Suu Kyi, Suu Kyi will be subordinate to the US-British special interests that have spent decades building up her political movement leading to her ascension to power. 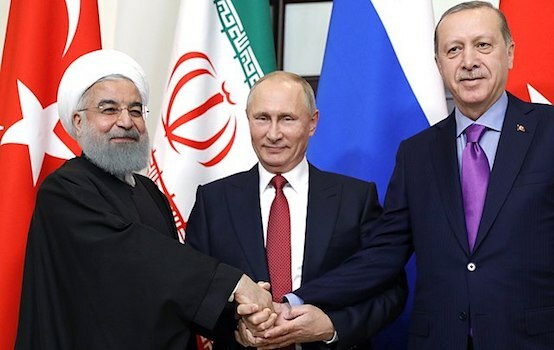 This recent development once again exposes the West’s selective and highly hypocritical commitment to the principles of democracy and rule of law, by its endorsement of what is essentially the creation of a dictatorship. The larger agenda at play is part of a decades-old geopolitical plan to create a united front against Beijing throughout Southeast Asia, along with efforts in Asia Pacific and Central Asia to contain the emerging world power. The Pentagon Papers released in the early 1970’s, admitted US involvement in the Vietnam War was in fact aimed at containing China. They also identified three fronts along which the US sought to achieve this containment from; the Japan-Korea front; the India-Pakistan front; and the Southeast Asia front. America’s military occupation of Afghanistan, Japan, and South Korea, along with the South China Sea confrontation it is cultivating against Beijing illustrate how from the 1970’s to today, the US is still actively trying to contain China along precisely these fronts. US attempts to manipulate the internal politics of Southeast Asian nations is also part of this wider containment strategy. While US proxies have been chased out of Thailand and imprisoned in Malaysia, US-British backed proxy Suu Kyi is now finally assuming office, albeit by proxy, in Myanmar. Aung San Suu Kyi’s entire political movement is a creation and perpetuation of Western special interests – particularly the US and UK. An army of nongovernmental organizations (NGOs), faux-human rights advocates, media organizations, and political movements have been created from whole cloth by the US State Department and British Foreign &amp; Commonwealth Office. Through a combination of political destabilization, economic pressure, and covert armed subversion, Myanmar has begun to transition over to a US-British backed political regime headed by Suu Kyi. Beyond platitudes of “democracy” and “human rights” she and her followers selectively afford supporters and deny opponents including Myanmar’s Rohingya population – little insight is offered regarding their vision of the future – except beyond “foreign investment,” that is. Aung San Suu Kyi was formally ruled out of the running to become Myanmar’s next president Thursday, as her party nominated one of her most loyal aides to rule the formerly junta-run nation as her proxy. Ms Suu Kyi has vowed to rule “above” the president, despite being barred from the top office by an army-scripted constitution. Suu Kyi is disqualified because she was married to a foreigner and has children carrying foreign passports. Though not stipulated in the constitution, Suu Kyi also spent an inordinate amount of time living abroad studying and working in both the UK and the US, including for the United Nations. Her entire political movement, including vast media and NGO networks are openly funded by the United States and United Kingdom governments. It would be safe to say that any American or British citizen who had similar backgrounds would be disqualified from running for the highest offices in either nation. However, double standards and the selective application of the rule of law have become hallmarks of Western foreign policy – with their proxy Suu Kyi no exception. 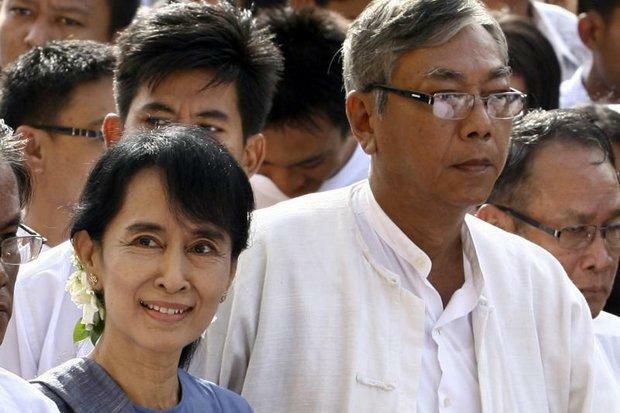 Suu Kyi’s nominee for president is her driver and long-time aid, Htin Kyaw. Like Suu Kyi, this would-be president of the former British colony of Burma is British educated and heads Suu Kyi’s Daw Khin Kyi Foundation which like the many political fronts supporting Suu Kyi’s political power, is funded by Western governments and foreign corporate-funded foundations including convicted financial criminal George Soros’ Open Society Institute and the Fortune 500-funded Asia Foundation. 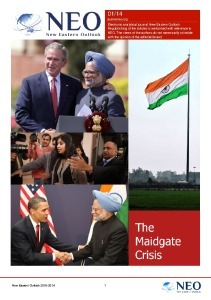 Considering the reality regarding the foreign interests propelling her into power and the illegal means by which they are doing so, it is no wonder the aged proxy has chosen to focus on vague slogans rather than the huge, unpleasant commitments she must now fulfill in exchange for the decades of support these foreign interests have lent her. For the rest of Asia, the West’s overt hypocrisy in Myanmar, assisting what is by definition a dictatorship into power, while condemning other nations as “dictatorships” for ousting foreign-backed proxies, is yet another warning and added impetus to reduce Washington’s influence across the region to a more proportional and manageable level.